Direct inversion of depth domain image gathers with Jason 9.6 depth Inversion – this image shows P Impedance and Vp/Vs results in depth with well log overlays, helping QI teams and engineers who need to plan wells and perform reserve estimations save time and improve accuracy (illustration: CGG GeoSoftware). 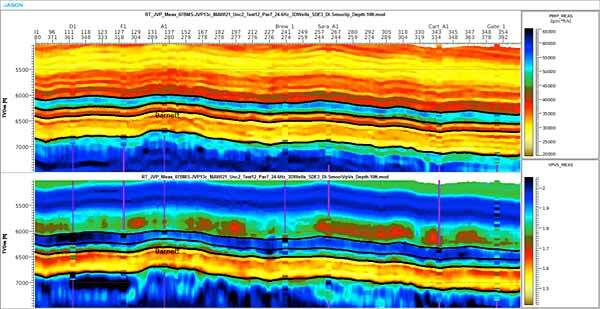 CGG GeoSoftware has announced a series of innovative software releases across its reservoir characterisation product portfolio. As part of its commitment to improve efficiency for interpretation experts, asset teams and reservoir engineers, the delivery of InsightEarth 3.1, Jason 9.6, PowerLog 9.6, EarthModel FT 9.6 and VelPro 9.6 offer more productive workflow solutions to address the challenges associated with more complex reservoirs. Anisotropic inversion, depth inversion and broadband wavelet estimation are some of the key technologies in Jason 9.6 to benefit from significant updates. Coming out later this year, HampsonRussell 10.2 will feature attribute extraction and prediction along horizontal wells and upgraded geostatistical mapping capabilities.